Elegant in their simplicity, these mittens use red embroidery stitching to create six festive designs. 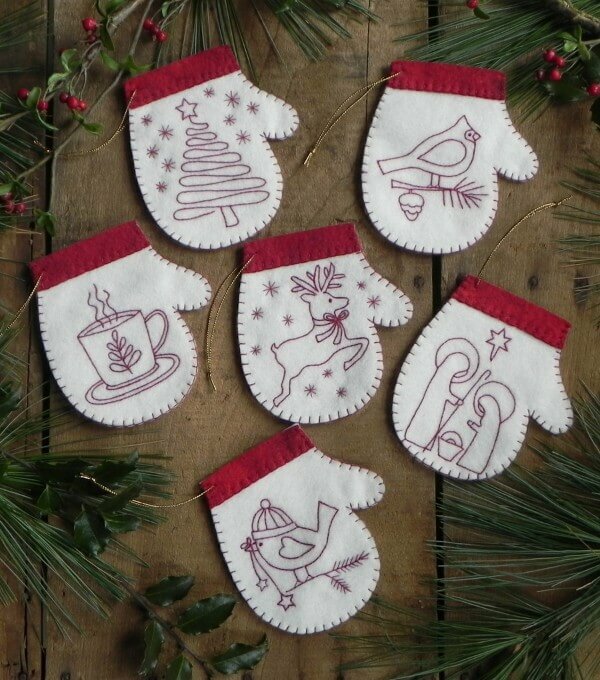 A reindeer, cardinal, steaming mug, Holy family, pine tree, and small bird with a hat are sewn in red thread on a white background. Mittens are finished with red cuffs and a red blanket stitch along the outside edge. Lovely for trimming a tree, they are also perfectly sized to hold gift cards or other small treasures. Each mitten is approximately 4� x 4 1/2�. Kit includes wool felt, embroidery floss, gold string, precise patterns (patterns are printed with iron-on transfer ink) and illustrated instructions to make 6 mittens. Colors are red and white.